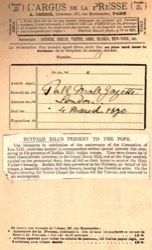 BUFFALO BILL'S PRESENT TO THE POPE. The ceremony in celebration of the anniversary of the Coronation of Leo XIII. yesterday excited (a correspondent writes) special interest this year, owing to the presence of Buffalo Bill's Indian troupe. They were drawn up in their characteristic costumes, in the Grand Ducal Hall, and as the Pope entered, carried on the gestatorial chair, they all fell on this knees to receive the Holy Father's blessing. 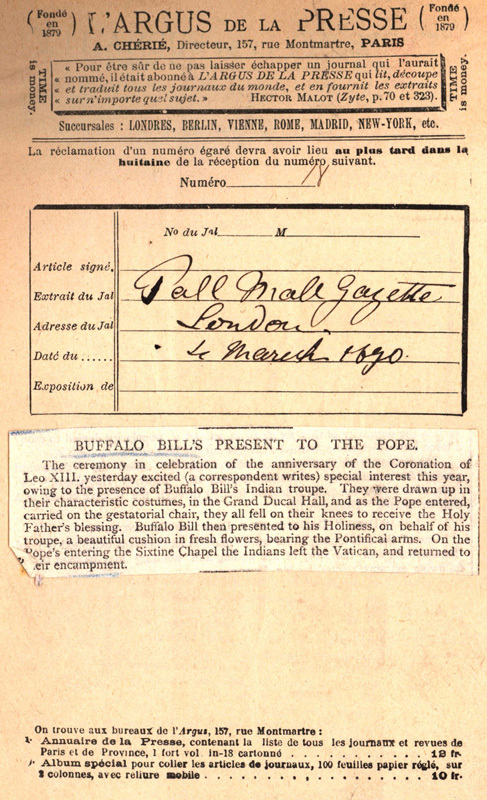 Buffalo Bill then presented to his Holiness, on behalf of his troupe, a beautiful cushion in fresh flowers, bearing the Pontifical arms. On the Pope's entering the Sixtine Chapel the Indians left the Vatican, and returned to their encampment.